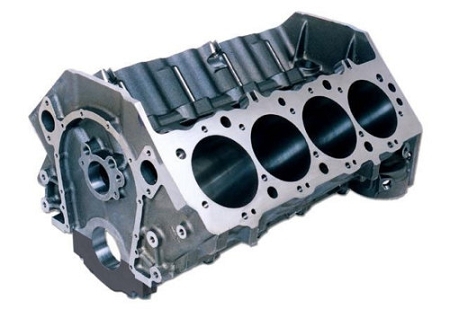 The Big M block gives you the versatility to build a wide variety of engine combinations. A true priority main oiling system oils the main bearings before the lifters for extra reliability. 9.800" or 10.200 deck height. 4.250 - 4.600" Available bore sizes with siamesed extra thick cylinder walls to resist cracking and improve ring seal (minimum .300" thick with 4.625" bore).